Knitted in a multiple of 16 sts, + 1 and 32-row repeat. Row 3: (K1, yo) 3 times, * (ssk) twice, sl2tog-k1-p2sso, k2tog twice, yo, (k1, yo) 5 times; repeat from * to last 14 sts, (ssk) twice, sl2tog-k1-p2sso, k2tog twice, (yo, k1) 3 times. Row 7: (K1, yo) 3 times, * (ssk) twice, sl2tog-k1-p2sso, k2tog twice, yo, (k1, yo) 5 times; repeat from * to last 14 sts, (ssk) twice, sl2tog-k1-p2sso, k2tog twice, (yo, k1) 3 times. Row 9: Knit all sts. Row 11: (K1, yo) 3 times, * (ssk) twice, sl2tog-k1-p2sso, k2tog twice, yo, (k1, yo) 5 times; repeat from * to last 14 sts, (ssk) twice, sl2tog-k1-p2sso, k2tog twice, (yo, k1) 3 times. Row 15: (K1, yo) 3 times, * (ssk) twice, sl2tog-k1-p2sso, k2tog twice, yo, (k1, yo) 5 times; repeat from * to last 14 sts, (ssk) twice, sl2tog-k1-p2sso, k2tog twice, (yo, k1) 3 times. Row 19: K2tog 3 times, * (yo, k1) 5 times, yo, (ssk) twice, sl2tog-k1-p2sso, k2tog twice; repeat from * to last 11 sts, (yo, k1) 5 times, yo, (ssk) 3 times. Row 21: Knit all sts. Row 23: K2tog 3 times, * (yo, k1) 5 times, yo, (ssk) twice, sl2tog-k1-p2sso, k2tog twice; repeat from * to last 11 sts, (yo, k1) 5 times, yo, (ssk) 3 times. 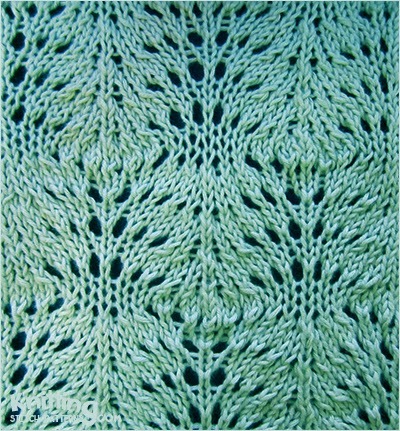 Row 25: Knit all sts. Row 27: K2tog 3 times, * (yo, k1) 5 times, yo, (ssk) twice, sl2tog-k1-p2sso, k2tog twice; repeat from * to last 11 sts, (yo, k1) 5 times, yo, (ssk) 3 times. Row 29: Knit all sts. Row 31: K2tog 3 times, * (yo, k1) 5 times, yo, (ssk) twice, sl2tog-k1-p2sso, k2tog twice; repeat from * to last 11 sts, (yo, k1) 5 times, yo, (ssk) 3 times. Row 32: Purl all sts. Slip 2 stitches together as if to knit 2 stitches together, knit 1, pass the slip stitches one at a time over the stitch just knitted and drop them: Sl2tog-k1-p2sso.